TOEIC; TOEFL; GED; GRE; SAT; OMG! LEL! TISA! Are you shaking your head right now and wondering what all of this means? It’s part of a game that we play here at the library: Standardized Test or Internet Slang. One person throws out an acronym, and the other has to guess which category it belongs to. Fun…right? Speaking of fun (and standardized tests), Learning Express Library (one of my favourite WPL databases, BTW) has been upgraded! Clap. Cheer. Hi-Fives all around. If you love learning, you’ll love Learning Express 3.0. 1. It’s Organized: There are nine Learning Centers in total, and they are organized by interest and clearly labeled. Content is available for students in elementary school right through to adults with careers. Here is a pretty handy breakdown of the resources available in each Learning Center. 2. Loads of Practice Tests: Canadian Citizenship; Border Guard; Police; TOEFL; TOEIC; MCAT; LSAT; GRE; SAT – if there is standardized test or career entrance exam out there, chances are Learning Express Library has a practice test for it. With instant scoring and detailed answer keys, these tests are exactly what learners need to help prepare for the big day. 3. Software Tutorials that are helpful: Word, Excel, PowerPoint, Illustrator, Photoshop, and more. Whether you need to brush up, learn a new version, or even learn software from scratch, you will find the tools in the Computer Skills Center. Most courses are broken down into: What’s New (ex. moving from an earlier version of an Office product to the 2013 version); Basic; Intermediate; and Advanced. If you’re wondering why I placed so much stress on “helpful,” it’s because so many software tutorials that I come across on the Internet are NOT helpful. 4. THE TUTORIALS HAVE VIDEOS!!!!! In case it’s not obvious, I’m pretty excited about this one. It’s one thing to read how to complete a task – but to watch somebody else complete it click by click without having to watch a 15 second ad beforehand – well, that takes it to a whole new level. 5. eBooks: There are hundreds of eBooks covering a wide range of topics: Resumes, Cover Letters, Career Guides, Marketing, Social Media, and more. You can view the complete list here. eBooks can be downloaded as PDFs, and are unlimited, so you can borrow to your heart’s content. While these are all of the reasons that I personally love Learning Express Library, they are really just the tip of the iceberg in terms of all that this eResource has to offer. Explore and see what appeals to you. If you have 16.43 minutes to spare, this video is worth a view. It’s no Game of Thrones, but it does thoroughly explain Learning Express Library and how to use it in far more detail than what I have offered here. 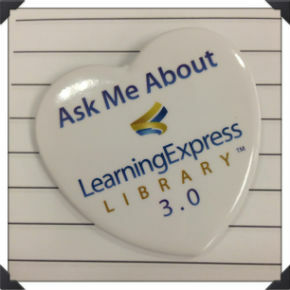 NOTE: You have to create an account to use Learning Express Library 3.0. – even if you created one in the past for 2.0. This version is built on a new platform, so nothing (accounts, tests, saved modules) carried over. If you have any questions, we’re happy to help you get started. Happy learning!